Working at heights is an expert’s game, and with falls from heights being the third-highest cause of fatalities in the workplace (Safe Work Australia, 2015), there are a number of responsibilities Sydney building and site managers need to be aware of to minimise risk. Prorax is here to help, as a one-stop shop for all your working-at-heights needs. 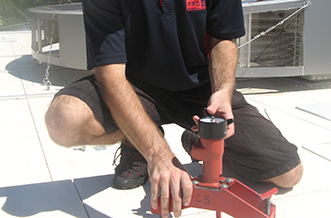 Whether you’re considering high rise window cleaning or conducting pressure cleaning or building maintenance at heights – or simply want to review your current practices – our accredited height safety experts can provide assessments, advice, infrastructure and certification. Backed by broad experience, constantly-updated qualifications and full insurance cover, our consultants offer the security of knowing that your building or site’s safety systems and procedures meet statutory requirements. To ensure you receive the most effective and up-to-date height safety advice and services, the Prorax team undergoes continuous training from one of the industry’s most renowned rope access safety instructors to enhance their skills and competency in every area.